Greetings all! 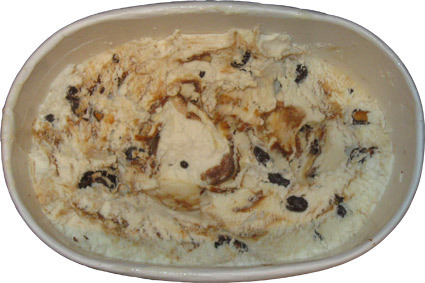 Next up is a Stone Ridge Creamery flavor which you can find at any SuperValu owned grocery store --- with 2500 stores nationwide, I'm guessing there is one near you (it's Shaws for me). Now I've already had this flavor twice this week, and it's not that I'm still deciding if it's good or bad, it's that I'm debating just how much I'm enjoying it. Too many words. Do I like it or love it? Let's find out. 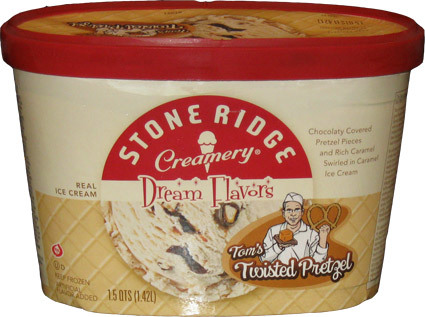 This is Stone Ridge Creamery's Tom's Twisted Pretzel Ice Cream. You may remember that four Dream Flavors came out last year and were all created by SRC employees. This one is chocolaty covered pretzel pieces and a rich caramel swirled in caramel ice cream. As you know, I adore pretzels (in fact, I'm pretty sure it's genetic), so I can't believe I've waited this long to try this one. Check out all those pretzel pieces! There's too many to count! (don't tempt me to try). Then we've got that generous caramel swirl going all over the place. Just like Phillip's Truffle Shuffle, we've got an abundance of mix-ins here. A good ice cream will get you going long before you take a taste, and this one certainly has the wow factor going for it. "Ok, so what's the problem?" you ask. Well, the problem is me. I looked at this stuff and totally psyched myself out for it to be one of the best flavors ever. Sure, there's a nice caramel flavor. Sure, there are more than enough pretzel bites. Sure, I'm overly picky. It just didn't settle well the first time, I wanted more! I wanted crunchy pretzel perfection! I wanted perfect chocolate coating! I wanted the impossible! More more more! Thankfully the second scoop went better. I started to settle, made sure I was in the right frame of mind, and dug in. It's not a super thick ice cream, but I dig it's soft and creamy nature balancing out the pretzel bits that I seem to find in pretty much every bite. Ok, I'm on my third scoop and my suspicions are confirmed -- I like this ice cream. I just can't help it. It's not perfect, but considering there aren't a lot of pretzel based flavors out there, this one is ranking pretty high in my book. I guess what really works for me is that lingering pretzel flavor. The caramel (and a lingering salty vibe) just really pops when you eat it. Heck, you even get pretzels stuck in your teeth as an added bonus. It's like eating a nice caramel ice cream out of a pretzel cone. I'm really glad Stone Ridge took the time to dole out some good pretzel love. I think the secret on this one is that you really need to let it melt a little so the caramel gets into every bite. Now that I think about it, every time I have a bowl of this stuff, I'm always tempted to go back for a second. It's not heavy (so enjoyable, but not overly filling), it's kinda sweet but definitely not too sweet, and it's just a nice change up in the freezer. If you dig salty or crunchy, give this one a shot. So you want more pretzels? Based on looks alone, this one wins. It looks delicious. I've never seen this in Indiana though. Boo! I'm jealous! I've never seen this in the DC area. It really does look good! I really enjoyed your last three reviews; they were more descriptive than usual. Keep it up! LOVE, LOVE, LOVE IT !!! !